It was an absolute privilege to interview Bernadette Lancefield – a lovely person and an amazing inspiration. You can read more at her blog, Eye Think. Article originally published in June 2012 edition of Gully News. The magic of the written word is its escapism, the ability to visit and imagine foreign worlds. Ferntree Gully writer Bernadette Lancefield has been writing since the age of six, and grew up with books such as Enid Blyton’s Magic Faraway Tree series. Six, however, is also the age at which she became blind due to a fluid build-up which led to optic nerve damage. But it has been the written word that has set her free, and she has never let anything hold her back since. ‘Writing can be very liberating and empowering,’ says Bernadette, 27. Upon finishing school, Bernadette went on to complete an Arts degree at Monash University and majored in English, and has since started work as a freelance writer. Using her trusty screen reader, she writes articles for various writing sites including an online magazine called DiVine (run for and by people with a disability), while also maintaining her blog, ‘Eye Think’. She is working on a novel about a girl who loses her sight. Bernadette also studied social work, and has worked with the homeless. ‘I had received help throughout my life and wanted to give something back,’ she says. 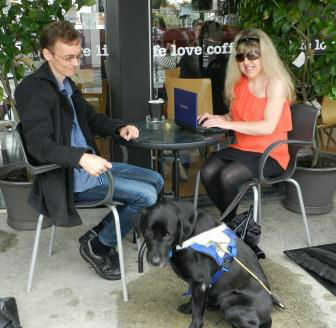 Passionate about spreading awareness for the vision-impaired, Bernadette and partner Phil have set up a social group for the blind. Originally named the Blind Coffee Club, Bernadette renamed the group after her seeing-eye dog, Zora. Zora’s Explorers now has around 18 members, and meets for various activities such as bowling, going on culture walks and dining at restaurants and cafes. The group is always welcoming to new members.